You may be wondering, "Wait, isn't this supposed to be WIP Wednesday?" Well, yes, but since a huge part of what I'm working on right now is launching Quilts for Cure, I thought this would be the perfect time to blog about our first campaign! First, an overview to connect the dots from lots of different Instagram and Facebook posts: Quilts for Cure is a (soon to be) nonprofit that exists to raise awareness about childhood cancer, provide every child in the US being treated for cancer with a quilt, and to fundraise for CURE Childhood Cancer's research programs so that kids can have safer, more effective treatments. In many ways, Quilts for Cure is a bridge and a network, connecting quilters with families who desperately need the encouragement and generosity I see and admire in the quilting community. Now, the campaign: Operation Smiley. When I was in high school, I was teacher assistant to a beautiful girl named Kylie Myers. Several years later, right about the time Hubster and I moved back to Atlanta after getting married, Kylie was diagnosed with bone cancer, the same bone cancer her best friend Bailey had just beaten. We didn't know it then, but Kylie only had about 10 months left to make us all smile while on earth. She kept smiling through her fight, and when she struggled, the amazing Smiley for Kylie community smiled for her. Now, as Kylie's 15th birthday arrives on February 24th, we are going to spread smiles in her honor to kids fighting cancer now. Goal: I will assemble each 20 blocks into a 4x5 quilt top and complete as many as possible in time to take them down to CURE Childhood Cancer for Kylie's birthday. CURE will distribute them to kids in treatment in Atlanta-area hospitals. How many quilts do you think we can make together? Four more blocks-- look, I'm 1/4th of the way to a quilt top! What if someone doesn't quilt but wants to participate? What if folks want their kids to get involved, but don't have a sewing machine? What if a class of students wants to make a quilt together? Or a valentine's party? So, I reached out to Allison over at Cluck Cluck Sew and asked her permission to write a tutorial using her pattern, and she said YES! Yay! Step 1: Press your fabric. It will be wrinkly from being folded on the bolt at the store, and we want it nice and smooth. Step 2: Make your templates. Use the ruler and pencil to make three shapes: 10.5 inches x 5.5 inches, 5.5 inches x 5.5 inches, and 2 inches x 2 inches. Cut them out. tep 3: Trace the templates on your fabric using the pencil (a wooden pencil will be easier than mechanical). You need TWO 10.5x5.5" rectangles, TWO 5.5x5.5 inch squares, and FOUR 2x2 inch squares. Trace the rectangles on a DIFFERENT color than the squares. Cut out your shapes. Step 4: Lay pieces right sides (the darker colored sides) together as shown. It's hard to tell with the white, but the FRONT of the rectangles is face-up, and the BACK of the squares is face-up, so the fronts are touching. This is probably the trickiest step because it's counterintuitive. Step 5: Use the ruler and pencil to draw your stitching lines corner to corner on the squares as shown. Pin pieces together so they don't move around while you sew. You can see the heart shape start to emerge. Step 6: Sew along the pencil lines. Try to keep your stitches small (about 1/8th - 1/4th of an inch) so that they stay secure. Knot your thread before you cut it at the end, too. As you get going, you can put several stitches on the needle at a time before you pull your thread thru, as I did here. Step 7: Trim away excess fabric 1/4 inch from the OUTSIDE of your stitching. Step 8: Use the iron to gently press your fabric open so all right (front) sides are facing up, as shown. Step 9: Repeat Steps 6, 7, and 8 with the other half of your heart block. 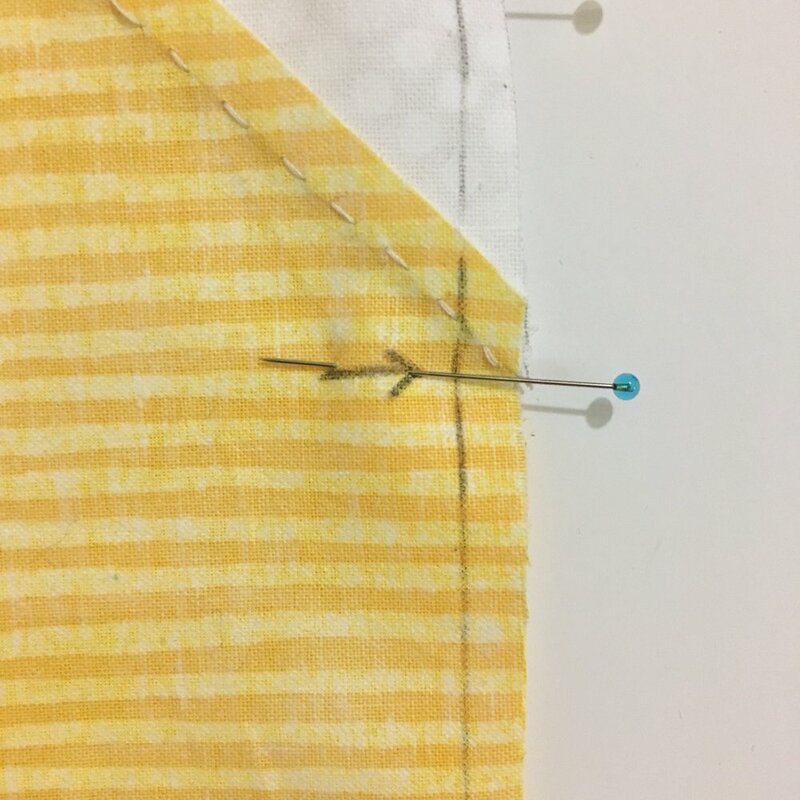 Step 10: Lay the two halves of your heart blocks right (front) sides together, draw a 1/4 inch sewing line as before, and pin along the center of the heart as shown. Be extra careful to line up the top heart point, where I've drawn an arrow. Step 11: Stitch along the drawn sewing line. Step 12: Use the iron to press the block flat with the seam to one side as shown. Ta da! You did it! Isn't that fun? It doesn't take long at all, costs very little money, and you, my friend, are contributing to making a child with cancer (and his or her parents) smile and feel loved. If you like, include your name and social media handle in a note when you mail me your block(s), and I'll tag you in pictures of the final quilt! Remember, Valentine's Day is coming, and I think this would be a fabulous party/event craft for upper elementary or middle school kids. If you're worried about the time it might take, you could cut and pin the fabric ahead of time, and just have them sew along the lines. If you send a group of blocks from an event, mention that in a note, and I'll be sure to include them all in the same quilt, so they can see the finished product after it's quilted! A few blocks would also make a lovely family service project one evening or weekend. About 16,000 kids are diagnosed in the US each year, and about 40,000 are in treatment-- I think it's so special that your kids could help these kids feel encouraged. Last but not least, I'd like to announce the launch of the Quilts for Cure website (and newsletter), Facebook, and Instagram accounts! Please sign up, like, and follow us to stay up to date on this project and others to follow. There are 1000x as many quilters in this country as kids that will be diagnosed with cancer this year. That's truly a village for every child, so let's work together to be that village of encouragers! Thank you for joining forces with us to pursue Kylie's vision: "For cancer to die, and not the kids." And until cancer dies, we are going to love and cheer on these kids!